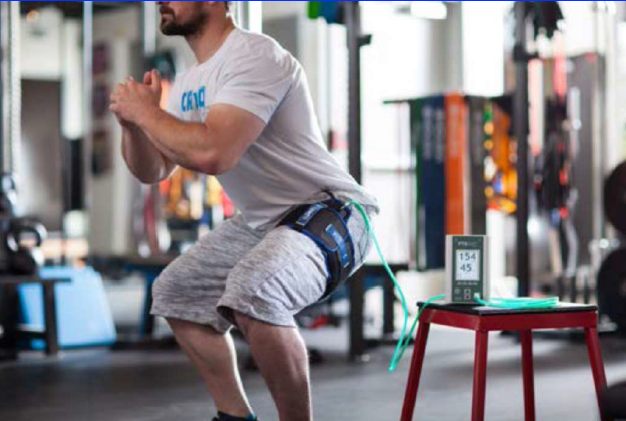 Blood flow restricted (BFR) rehabilitation is the brief and intermittent occlusion of the blood flow in veins using a tourniquet while exercising. Using this technique you can exercise with significantly lighter weight while still creating a hypertrophy (growth) and strength response. Traditionally to get hypertrophy and a strength response in your muscles you would need to lift a heavy load. The goal is to reduce just enough blood flow to create positive changes. However the amount of pressure used varies between individuals. The size of your limb, density of the soft tissue in your limb, blood pressure, placement of the tourniquet, and width of the tourniquet, all must be taken into account when determining your personalized pressure. Your healthcare provider will utilize a specialized tourniquet system built with a monitor to account for these variables. Additionally, your healthcare provider will discuss potential contraindications to this treatment with you to determine if you are a candidate. Once your personalized pressure is determined you will begin specific exercises based on your rehabilitation plan. Even though you are lifting a light weight your muscles will begin to feel like it is working very hard. This feeling In your muscle is the buildup of lactate and is the desired response of this training. It is important that you complete the total number of sets and repetitions prescribed by your healthcare provider in order to maximize this response. You may also begin to sweat and feel your heart rate rise similar to what you experience during a heavy workout. This is common and expected. Adverse side effects are rare. The most common effects are residual swelling in the limb, a fatigued muscle and possibly some mild soreness. These are transient and usually resolved\ within 24 hours. If you have prolonged swelling, fatigue or soreness, discuss this with your healthcare provider along with any other concerns you may have.